Who said salads are boring? They don’t always have to be made of lettuce. This salad is made of fresh and flavorful Mediterranean ingredients. 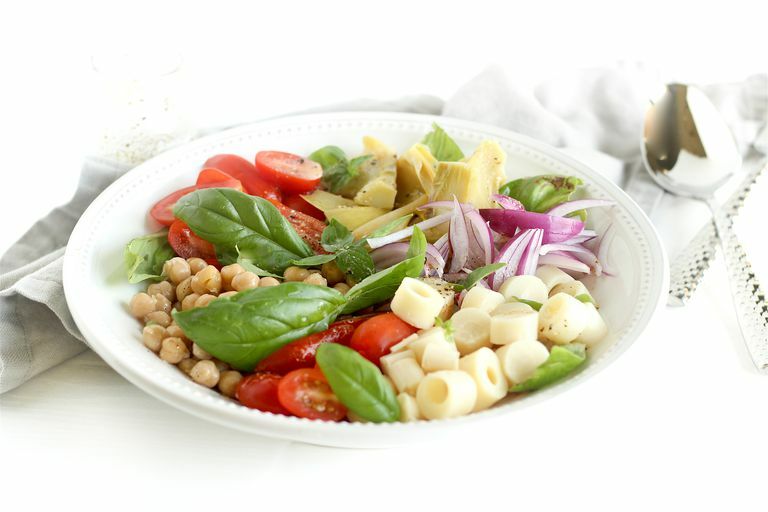 Cherry tomatoes, basil, red onions, marinated artichoke hearts, hearts of palm, and chickpeas all combine into a hearty and filling salad that is bursting with flavor. Vegetables and legumes provide almost half of your daily fiber needs, while heart-healthy olive oil adds healthy monounsaturated fats to keep you full and satisfied. Chop hearts of palm into bite-sized pieces. Add to a bowl with chickpeas, tomatoes, onion, basil and artichoke hearts. Whisk together oil, red wine vinegar, water, pepper, and feta. Pour over salad and gently toss to combine. You may eat this salad on its own for a delicious and filling vegetarian lunch, or serve with grilled chicken or fish for a more protein-rich meal. You can find hearts of palm in the canned food aisle of most supermarkets and grocery stores. This salad can be made ahead of time and stored in an airtight container in the refrigerator. It is great for making ahead and packing for lunch. The flavor gets even better as it marinates in the refrigerator!